This charming gite has been fully renovated. You will be delighted by the landscape and charm of this place. Le Meynicot is an authentic traditional farm offering all the comforts. It is ideally located in the heart of Périgord. Inside, it has been completely renovated combining charm and comfort. The property consists of a main building with 3 bedrooms, a dining room, a lounge with fireplace, a desk, a modern kitchen, and a bathroom. There is also an annexe with a living room, a large bedroom, a bathroom, and a toilet. It is on the top of a calm and isolated hill. Tranquillity and rest are guaranteed. The property is located on a 3000-sq.m park with an unobstructed view of the grassland and the woods. There is a private heated pool, a shaded terrace,2 garden seating areas, a stone barbecue, a hammock, swings, a ping pong table, a badminton court, and a lit up boules court. There is an amusement park nearby. In the surrounding areas, there are many cultural tours available, such as the Lascaux Caves, the prehistoric museums, trips in gabarre boats on the Dordogne River, and canoeing. You can also visit the wine-producing properties and the markets with mushrooms, foie gras, and truffles. The holidaymakers that visit Le Meynicot come looking for the calm and quality of life it offers. Ideal for 2 families with children, the dependency offers certain privacy, and the gated pool, as well as the complete absence of cars, makes the place safe for children of all ages. Adolescents will not get bored with the heated pool, the Ping-Pong table, or the badminton court. Adults will definitely enjoy the boules court, lit up at night, or the siestas in the hammock under the shade of a large oak tree. There are many possibilities to hike in the forest, starting from the house. For those who love mountain biking, there are many waymarked paths, and those who love cycling will find many quiet, but hilly routes starting from Le Meynicot. We will be in charge of welcoming our holidaymakers to make them know our place and give them advice about cultural activities, leisure activities, and the gastronomy of our region. You will also recommend some local products such as foie gras and other specialities of Périgord, as well as many gourmet restaurants according to your expectations. Le Meynicot boats a unique location. In fact, it is located in a heaven of tranquillity, in the middle of many hectares of woods and grassland, without neighbours nearby, but only 5 minutes away from Vergt. Its location guarantees relaxation and safety for families with children because there are not roads nearby. 2 bathrooms renovated in 2010, an exterior shower by the pool. Linen is provided for rentals of 2 weeks or more. If you're looking for a genuine, characterful French house in secluded, peaceful location with only the sounds of the countryside then 'Le Meynicot' is the ideal place. Yet within 5 minutes there is the village of Vergt with a Boulangerie, restaurant, bar etc.and 1 or 2 minutes more and you're at a well stocked Intermarche with everything you need (including a good selection of wines) for your everyday needs. We were met and shown around the house by Paul who we cannot praise too highly. He is very friendly and relaxed and speaks excellent English which made everything so much easier (especially as my French is pretty mediocre). The house had everything we needed for a comfortable and relaxed 3 week stay and EVERYTHING WORKED. The 'photos do not really do the house and annexe justice and especially the pool which is much bigger and better than it looks in the 'photos. In 3 weeks there were only 2 days when it was too cold to swim as the pool cover was so efficient (also helped by the wonderful weather). The pool has a half circle section about 450mm. deep, ideal for toddlers and non swimmers as well as a deep end and was warm, lovely and clean in addition to being salt water. The whole place, including the large garden would be especially ideal for families with swings, petanque, table tennis etc. and plenty of room to kick a ball about. In 20 years of renting in France this is definitely one of the best, If not the best holiday home we have stayed in. Many thanks Paul. What can I say after such a wonderfull review ?!! Our guest were absolutly "delicious" and so friendly. We realy do our best to satisfy our guest and it's the most beautiful reward than we can expect. We have just finished our two week holiday and it couldn't have been better. The villa was lovely with everything we wanted and the pool was just what we needed as we had superb weather. Paul the owner, couldn't have been nicer and luckily his English was so much better than our French lol. He gave us his mobile number in case we needed it, which we did when a short thunder storm knocked the electric out - we sent a text and Paul was at the villa almost immediately to fix it. He also sourced the most amazing local strawberries - if you stay you should ask him to do the same as they are delicious! The house was clean and tidy, totally away from it all. Pool was heated especially for my disabled daughter, Paul was especially helpful. Fantastic house with great facilties in a peaceful setting. We loved it! The property has excellent facilties including a wonderful pool positioned to get the sun well into the evening. Loads of space and perfect for two families. 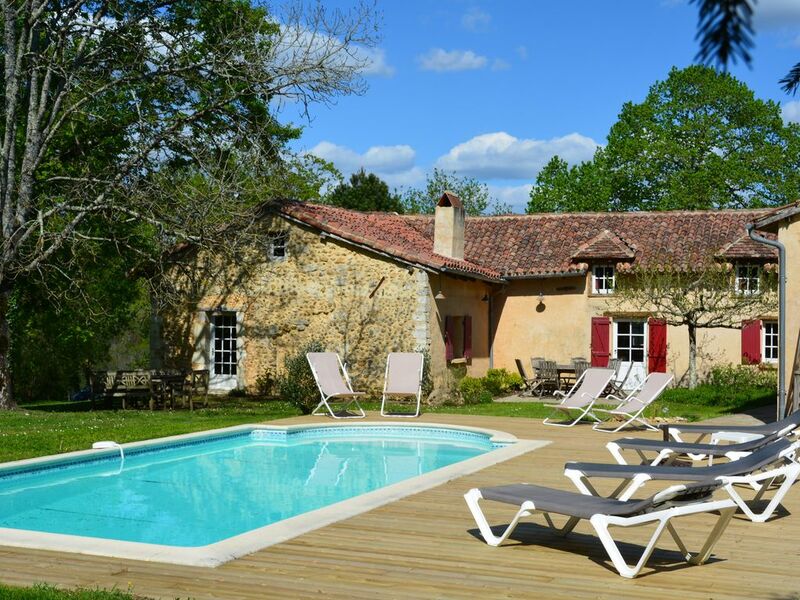 It is close to local attractions and historical sites around the Perigord and Dordogne region but also includes swings, boules court and table tennis as well as a brick BBQ perfect for alfresco dining! The pool is clean and safe our 3 year old girl loved it! The owners are warm and welcoming and nothing was too much trouble. Highly recommend and we will definitely be back! Les propriétaires sont très prévenants et serviables. Au cours de notre séjour, s'est produit un gros orage et le propriétaire est intervenu très rapidement pour nous rétablir l'électricité et dégager la route menant au Meynicot qui était entravée par l'affaissement d'un arbre. La région est magnifique et de nombreux sites intéressants se trouvent à une demi-heure de voiture. On se trouve loin de la foule, mais c'est vraiment l'endroit rêvé pour se ressourcer et déconnecter du quotidien. Les vacances nous semblent être passées trop vite et nous sommes à peine rentrés que nous rêvons d'y retourner. C'est un endroit plein de charme et de caractère, aménagé avec goût et nous ne pouvons que recommander ce gîte dans lequel nous avons passé des vacances qui comptent parmi les meilleures que nous avons jamais passé en France. Donc, un grand merci à Monsieur et Madame Carlier. Nous avons passé un excellent séjour au Meynicot! Les propriétaires sont très accueillants et extrêmement sympathiques. Nous étions 2 couples et 5 enfants au total. Ce fut des vacances au top, dans cette jolie maison périgourdine, pleine de charme, au calme ( très appréciable) et dans un joli coin de verdure et de nature. La maison est bien équipée, les couchages sont bons. Le seul hic est que tous les matelas n'avaient pas d'alèse. L'espace "enfant" à l'étage avec leur chambre et la salle de jeux était top. Super idée d'avoir mis à disposition des playmobils, les enfants ont beaucoup joué. Seul bémol est qu'il fait un peu chaud dans les chambres du haut (maison principal et dépendance) lors de fortes chaleur. Sans hésiter, nous recommandons cette location, pour des vacances reposantes en famille ou entre amis. Merci d'avoir séjourné au Meynicot cet été. Nous mettons tout en oeuvre pour que nos vacanciers passent un très agréable séjour et nous sommes ravis que vous ayez passé une "super" séjour". Merci de votre belle appréciation. Concernant les alèses, mea culpa, il s'agit d'un oubli ! Pour ce qui est de la chaleur dans les chambres du haut il est vrai que nous avons eu des températures exceptionnellement élevées cette année. Après votre départ nous avons installé des ventilateurs puissants et silencieux qui ont beaucoup amélioré le confort. En espérant avoir le plaisir de vous accueillir de nouveau au Meynicot. The property is ideally located in the heart of Périgord, 20 km away from Périgueux, 30 km away from Bergerac, and 50 km from Sarlat. Le Meynicot is 2 km form Vergt, where you will find all services: 2 supermarkets, bakeries, bookshops, doctors, pharmacies, and much more. It is possible to swim and fish in the lake of Neuf Fonds, located 2 km away. The cinema, the aquatic centre, and the nightclubs of Périgueux are just 20 minutes away by car. There are many tourist sites nearby: Sarlat, the Lascaux Caves, Les Eyzies, Le Bugue, Monpazier, Beynac, and the vineyards of Bergerac and Bordeaux, approximately 1 h away.